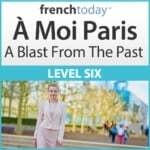 Learn about the French cold cuts – la charcuterie – the French names, common French charcuterie dishes, precise directions on how to eat charcuterie politely, what it is made of. When we have American visitors over for lunch, we usually want to serve something simple, yet typically French, that we could eat fast since we take off to visit Brittany in the afternoon. So here is a pretty traditional French charcuterie mix and the way to eat it with respect to French table manners. Made from pork meat and fat, and a bit of pork liver. If you eat it during an informal meal, you usually cut a piece with your knife and spread it over a small slice of “baguette”, which you’ll then eat holding it with your hand in a couple of bites. If you want to be really proper about it, you should tear off a bite-size piece of bread, then cut a bite-size piece of pâté, place it on the bread with your knife, then balance the piece of bread/pâté to your mouth and eat the whole thing in one bite. Then repeat. You could also make a sandwich with it, but not in this style of luncheon. You know that one. Eat with fork and knife. Note that in France, we differentiate “jambon blanc” (the cooked version) and “jambon cru” (the uncooked and smoked/aged versions like proscuitto, parma or bayonne). The ham may have a greasy edge that you may remove with your fork and knife and leave on the side of your plate. It’s somewhat similar to Italian salami. We usually remove the skin before eating it, alone (fork and knife) or with a bite of buttered bread (delicately holding the bread and piece of salami in your hand). Pork meat with garlic. I personally eat the skin, I’ve seen people remove it. You eat it alone or with a bite of buttered bread. Usually made with pork and veal, but could have other meats, and surrounded by a crust, and usually a bit of savory jelly. You cut it with knife and fork and eat it like that. Watch out for that one, it’s quite an… acquired taste :) it’s made with tripes, a French offal, and it has a pretty strong taste. You usually remove the skin. Eat it alone or with a bite of buttered bread. This one is made with the nose part of a pig, but you wouldn’t know if I didn’t tell you. It tastes like ham and is sold/served in a French Vinaigrette or dressing. Eat it with fork and knife. This is like a shredded pork meat pâté, quite fatty, and you spread it on bread. The jar comes with a layer of fat on top that you usually remove in your plate. The tip is very tender, but the end can be quite fibrous, so sometimes you don’t eat the end. Tip: In France, you commonly find these white Asparagus ready to eat in cans or glass jars. My father-in-law (a professional chef) always saves some of the water from the container to make the dressing lighter and tastier! Shredded celery with a ton of mayo and a bit of mustard (as fatty as charcuterie if not even worse…). Eat with knife and fork. Hold on the green part, eat the red and white part: put a bit of salt on your plate, bite the radish, dig it in the salt, bite again (it’s your plate, double dipping is allowed! ), you may at the same time take a bite of buttered bread. Leave the green part in your plate. 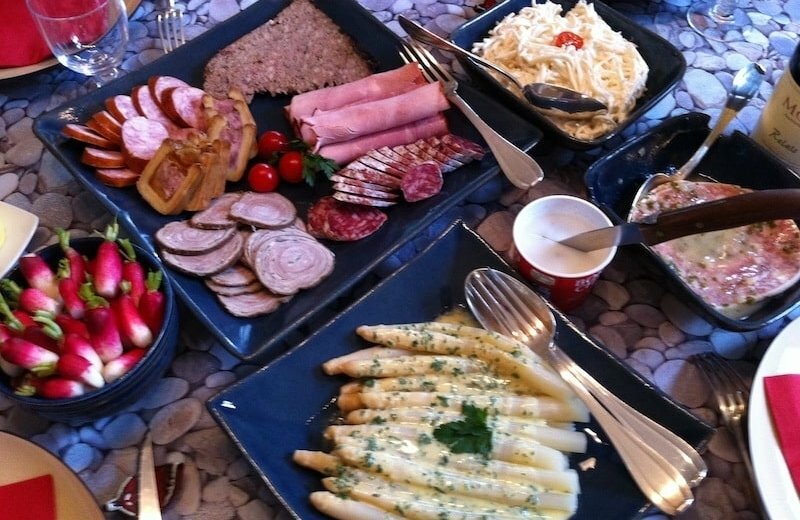 And of course, eat “des cornichons” (gherkins) at will with all the charcuterie, and drink a lot of French wine! !